This is the larger version of one of my most popular crochet earring patterns, and just stunning in this gold metallic crochet thread! The shape and pattern are really pretty and can be worn by anyone. They are very lacy and feminine. One of the great things about crochet earrings is that even the larger ones are very light weight. These are crocheted with size 10 cotton crochet thread in gold metallic, which is beige cotton thread with a gold metallic thread woven around it . The crocheted part of the earring measures 3 1/2 inches, and they hang just under 4 1/4 inches including the hook. 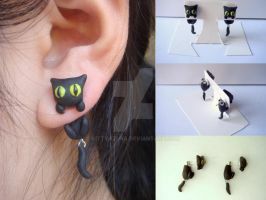 The widest part of the earring is 2 inches. The hook is gold plated, nickel free. All earrings are washed and blocked (shaped), and I've added a stiffening agent so that they hold their shape forever. I will happily create this pair of earrings in your favorite color - custom orders are normally created and shipped out within 48 hours. In-stock orders ship immediately. Shipping is $1.95 for unlimited items. Is there a pattern available for this?